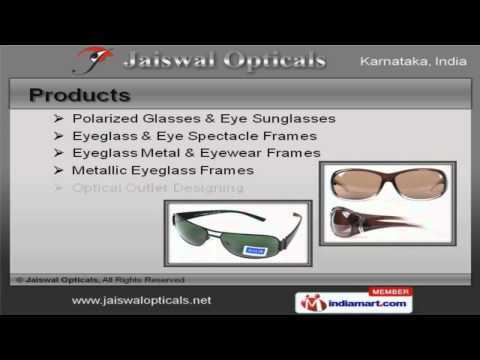 Welcome to Jaiswal Opticals, Offer Sheet Metal Frames and Optical Outlet Designing services. The company was established in 2009 at Bengaluru. State-of-the-art infrastructure and Wide distribution network make us different from others. Peerless quality products, Compact design and accuracy are the plus points of our organization. We offer a wide assortment of Optical Outlet Designing, Eyeglass and Eye Spectacle Frames. Our Polarized Glasses and Eye Sunglasses are best in the industry amongst others. We offer Eyeglass and Eye Spectacle Frames that are in huge demand across the global markets. Eyeglass Metal and Eyewear Frames offered by us are some of our best selling products. Along with that we offer Metallic Eyeglass Frames that are a class apart. We also provide Optical Outlet Designing that are extremely reliable.